As my New York days come to an end (for now), I’ve been spending more time at one of my favorite places, the Met. The Metropolitan Museum of Art offers free tours and is open until 9 p.m. on Fridays, so I walk there after work. Last week I took a guided tour of Old Master Paintings from the 13th through the 18th century. Our host was particularly interested in discussing vanitas (Latin for vanity), a style that focuses on the brevity of life and meaninglessness of material things and earthly pleasures. 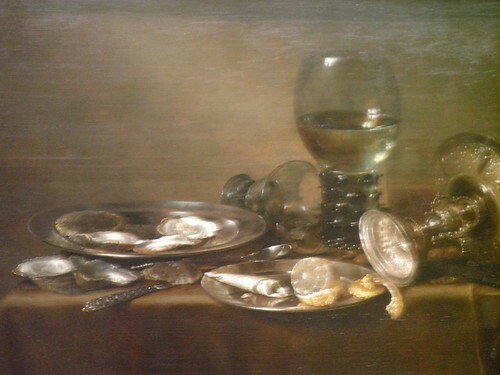 We saw Willem Claesz Heda’s Still Life with Oysters, a Silver Tazza and Glassware (1635). During this time, the Dutch were rolling in money, but the party is over in this piece, with broken glass, empty oysters and a souring lemon. In person, the details of this painting are amazing, particularly the drinking glass. I believe our guide said the reason for the ridges on its stem were to prevent it slipping from greasy fingers.